Recently, I received this brief story about an object in the current night sky from Neil Norman of Ipswich, England. Because this comet will reach perihelion (closest approach to the Sun) in mid-November, it couldn’t appear in print because that deadline has passed. So, we thought it best to reproduce the story here. Thanks for sending this, Neil! There's always something exciting, or dare I say magical, about a bright comet well placed over the festive period near year’s end. 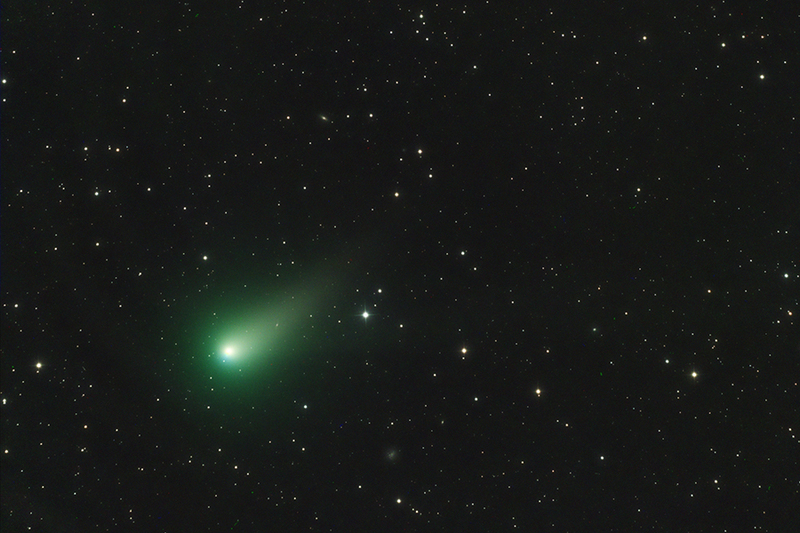 In 2014, we had Comet Lovejoy (C/2014 Q2), which was a nice binocular object around Christmas. In early January this year, it attained naked-eye status — not bad for a comet once expected to reach only magnitude 10 at best. This year we have a comet that should, at the very least, put on a similar fine binocular display, and even possibly reach a naked-eye magnitude. It carries the designation Comet Catalina (C/2013 US10). Its unusual designation is due to the fact that when discovered back on Halloween night in 2013, by the Catalina Sky Survey near Tucson, Arizona, the initial suspicions were that this object was a large periodic Near Earth Asteroid. Some confusion was added when a pre-discovery observation was wrongly linked to the comet, but once astronomers rectified this, the Minor Planet Center finally announced that the object was cometary in nature. The Catalina Sky Survey team is dedicated to finding near-Earth objects and potentially hazardous asteroids. They imaged an area in Aquarius with their 27-inch Schmidt telescope. Richard A. Kowalski, while scanning the images, spotted the magnitude 18.6 object. At discovery, the comet was 8.30 astronomical units (A.U.) from the Sun and 7.66 A.U. from Earth. An astronomical unit is the average distance between Earth and the Sun. To get an idea as to how far the comet was from the Sun at discovery, the mean distance of Saturn from the Sun is 9.3 A.U. For a comet to be visble at this distance bodes well for its activity (and visibility) at perihelion. Once scientists calculated an accurate orbit, it became apparent that Comet Catalina was a Dynamically New Comet, fresh from the Oort cloud that stretches more than 1 light-year from the Sun. Its inward journey is its first into the realm of the planets, and it’s approaching on a steeply inclined orbital trajectory of 148°. The problem associated with some comets of this type is that they tend to show early brightening trends at large distances because their pristine ice-covered nuclei reacts strongly to its first feel of solar radiation. This ice quickly sublimates, however, and as the comet gets closer to the Sun, most of the material is gone. What’s left is a dark crusty nucleus with little in the way of original potential left to give. C/2013 US10 had this stuttering period too. In June of this year, the comet was two magnitudes behind prediction (at magnitude 16) but thankfully, a couple of weeks later, it returned to the 12th-magnitude brightness that observers expected. As of mid-September, the comet stands at magnitude 6.5. The comet appears in current images as greenish-teal in color with a faint ion tail and stubby dust tail. Latest spectral readings of the comet show a high level of diatomic carbon (C2) being released. The active jets on the nucleus are releasing this C2 and also cyanogen (a poisonous gas), which are both colorless. When they encounter the ultraviolet light in sunlight in the near-vacuum of space, however, they fluoresce green. The comet is still beyond the orbit of Mars but is within the imaginary “frost line” situated at around 3 A.U. from the Sun. This is the point where water begins to sublimate. The comet is now beginning to fully awake from its deep-frozen slumber. The rate at which the comet is releasing dust is also increasing steadily. Currently, the nucleus is shedding around 3.3 tons (3,000 kilograms) per second, and a fairly decent dust tail should develop after perihelion. At perihelion on November 15, the comet will be 0.82 A.U. from the Sun, travelling at 100,800 mph (46.44 km/sec). It will then lie 14.2° from the Sun. Eleven days later, the comet will cross the celestial equator making it visible to Northern Hemisphere viewers. At this point, it will lie in the constellation Virgo at 6th magnitude 26.8° from the Sun. Current estimates are that the comet could peak at magnitude 4 and should remain above 8th magnitude until April 2016. After perihelion the comet will continue to follow its hyperbolic ejection trajectory out of the Solar system never to return again.